KANSAS CITY, Mo. 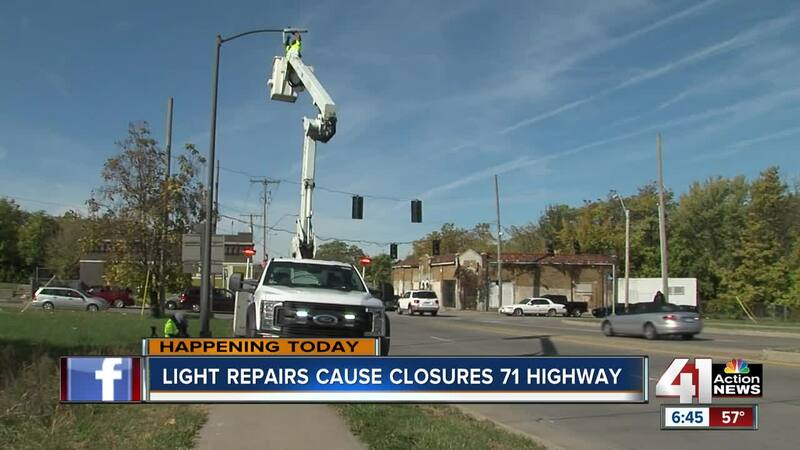 — On Monday morning, light repairs will continue along 71 Highway that could impact traffic. Beginning at 9 a.m., the Missouri Department of Transportation will close one southbound lane between 75th and 87th streets. Capital Electric crews will be replacing overhead lights along the highway. MoDOT said that thieves keep stealing the copper wiring from inside the posts. More than 900 lights along an 11-mile stretch of 71 Highway have been impacted by the thefts. Because of this, tamper-proof access doors will be installed so that thieves can't break into them. The southbound lane of 71 Highway should reopen by 3 p.m, but crews will be working all week on the lights. Next week, they will move to the northbound lanes.